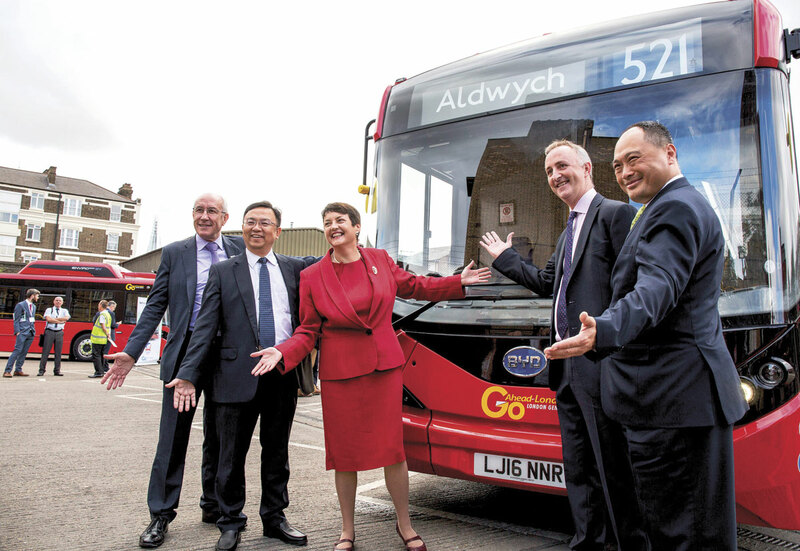 The official launch of a fleet of 51 new ADL bodied BYD e-Bus fully electric buses for use on TfL services 507 and 521 took place at Go-Ahead London’s Waterloo depot last Friday, though the first of them had already been on the road for a little over a week by this time. 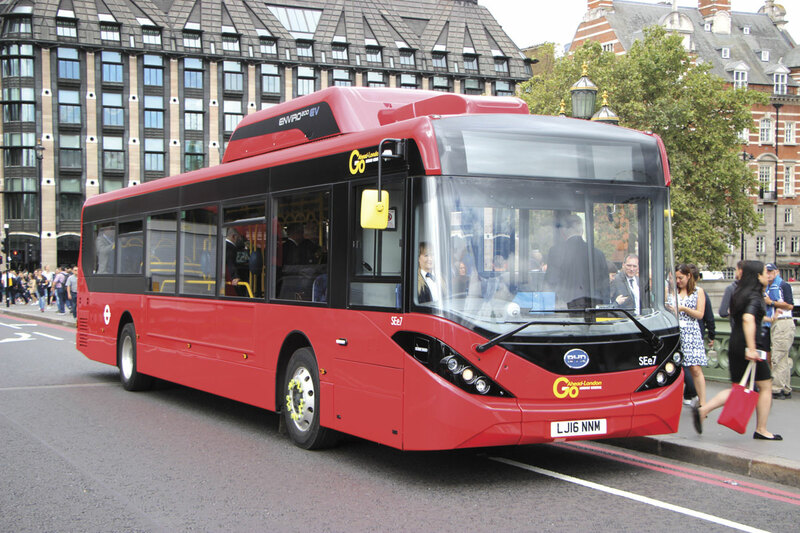 It marked the culmination of a process started five years ago when TfL’s Director of Buses, Mike Weston and the late Phil Margrave, then Group Engineering Director of the Go Ahead Group, first visited the BYD (Build Your Dreams) plant at Shenzhen in China. 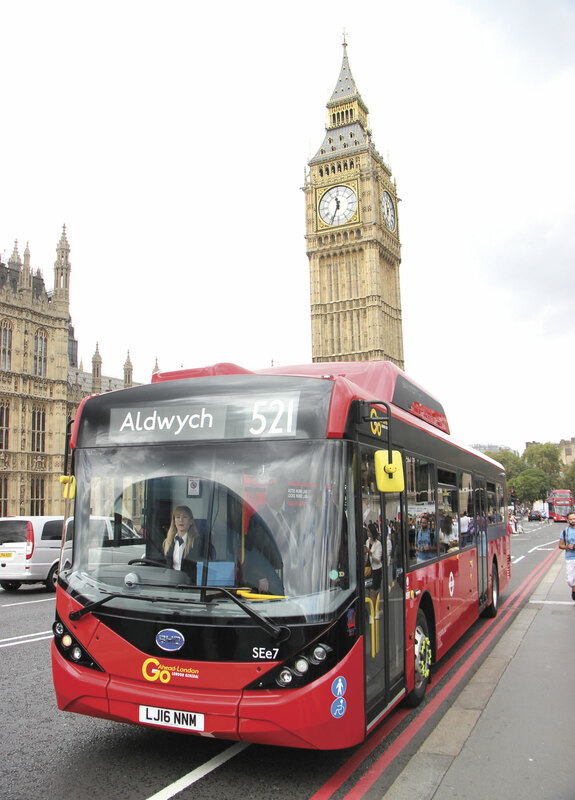 Two years later, in December 2013, the first BYD fully electric single deck buses for London began operation with Go Ahead from its Waterloo garage where two charging stations had been installed. Both buses were 12m models completely constructed by BYD, a world leader in the development and production of lithium iron-phosphate automotive batteries which employs 200,000 people, more than 16,000 of them R&D engineers. It has now supplied over 10,000 fully electric buses worldwide, the largest European order prior to this being one for 35 buses delivered to Amsterdam’s Schipol airport. 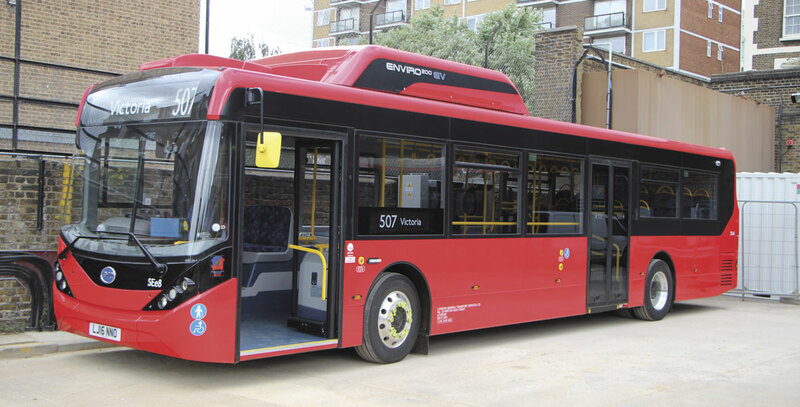 BYD is the prime contractor for the £19m deal which includes contract maintenance and the charging stations in addition to the buses, although the contract for the electrical equipment required in addition to the chargers was put out to tender. 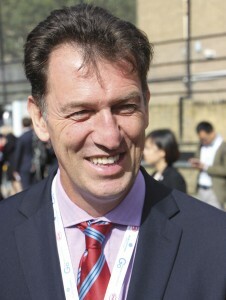 Also attending was Leon Daniels, TfL’s MD Surface Transport, who pointed out that the vehicles’ entry into service would give London, ‘the largest electric fleet in Europe’ congratulating the manufacturers on fusing together their technologies to produce buses that were ‘silent and emission free’. He revealed that this week TfL had announced the award of another single deck electric route and, in time, double decks would follow. Although the Chairman of BYD, Wang Chuanfu, was present, it was Isbrand Ho, MD of BYD Europe, who spoke for the company, saying, it was, ‘A historic day for London and Europe as a whole.’ He continued, ‘Today is the culmination of several years of hard work and we are delighted to be here with our partners TfL, Go-Ahead and ADL inaugurating Europe’s largest electric bus fleet. In the UK we have a dedicated support team, a new office, a new Country Manager and will shortly be acquiring a workshop and parts store within London. We are in discussion with several potential customers for our electric buses and look forward to helping more operators and their city governments to assist in improving air quality.’ He also pointed out that the 51 buses would save 700tonnes of CO2 per year, as well as eliminating NOx and others pollutants from London’s air. Whilst the technical challenges of developing the vehicle have been considerable, at least as difficult has been the process of ensuring that all of the necessary infrastructure is in place to keep them on the road. 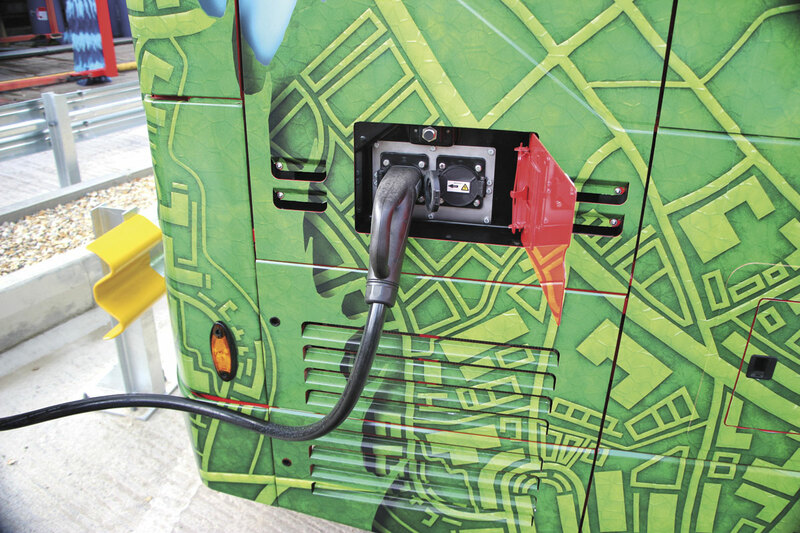 It has been occupying Go-Ahead MD John Trayner and his team extensively since the idea of running electrics was first mooted because charging an electric bus isn’t simply a case of plugging it in to a standard socket for a while and then driving off again. John explained to me that, working with the utility companies it had been calculated that the worst case power requirement to charge the buses would be 2.5MW, though he believes that in practice the figure is probably considerably less than this. If this is the case it may be possible to introduce efficiency savings at a later stage. Throughout the process Go-Ahead has worked in partnership with UKPN (UK Power Networks) who deliver the 2.5MW to a point at the rear of the premises, and SSE plc who have been responsible for taking the supply from there and the installation of all of the extensive infrastructure required thereafter. Go-Ahead London Engineering Director, Richard Harrington, walked me around the site and explained that from the grid, electricity goes into two on-site sub stations at 11,000volts. These feed two transformers which convert the voltage to 400v. This then passes through two different sized distribution boards that then supply the individual chargers. One board supplies 17 chargers and the other handles the remainder. In total, Go Ahead will be running 46 buses from Waterloo and charging points have been provided for 43 of them. 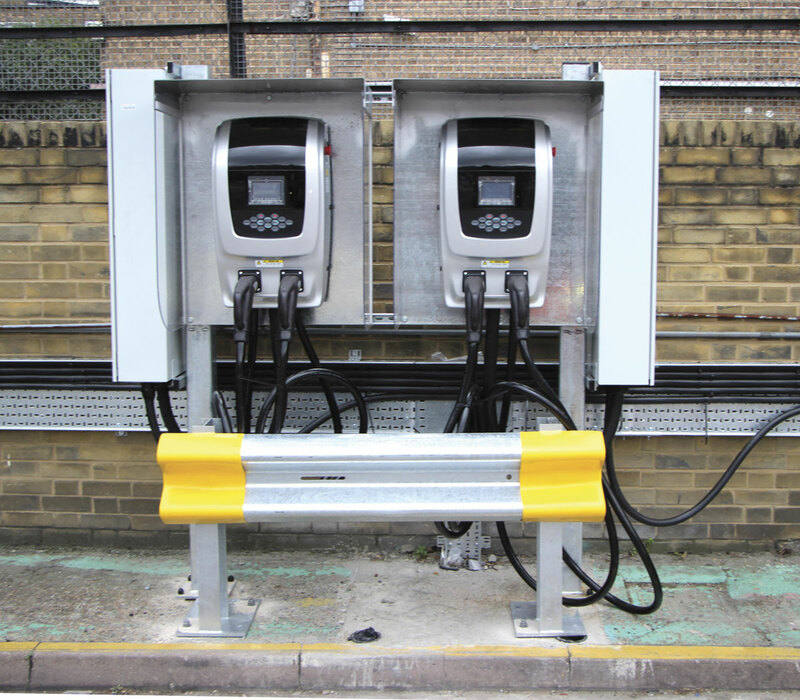 39 of these charge at 40kWh and, to increase flexibility should it be necessary, the four charging bays at the rear of the depot are equipped with fast chargers charging at 80kWh. The fast chargers are capable of fully recharging the batteries of a bus from empty in four hours. In practice, none of the buses should ever completely drain their batteries. Mileages vary from a maximum of 138 to as few as 35 miles daily, with the average around 70 miles. Even on the more arduous duties the buses come back in with between 20-25% charge remaining, and some come in having only used 25%, greatly reducing their recharging requirement. 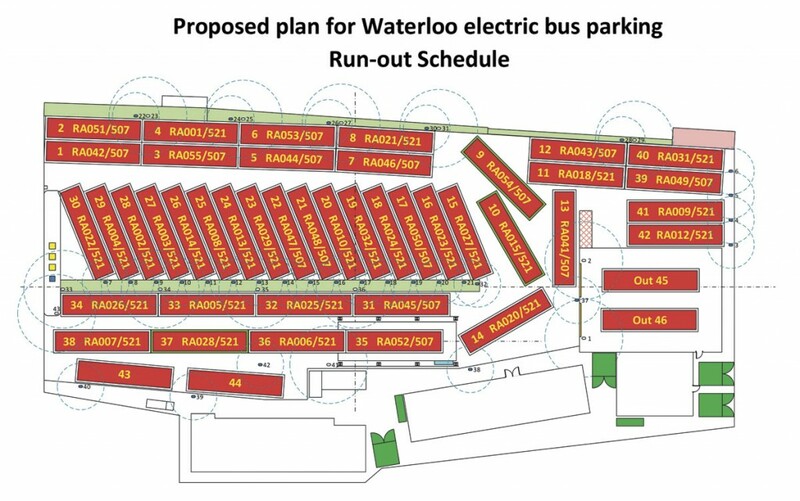 Waterloo is not a large garage and in order to accommodate the charging stations it has been necessary to remodel it in order to fit in sufficient charging bays and maintain access for buses entering and leaving. Most buses are parked in echelon to charge. Extra parking space was created by moving the bus wash to one side of its original position. 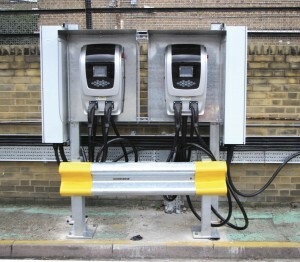 It is an aspect of running electric buses, especially from a facility with the space restraints of Waterloo, that the state of the charge on each bus has to be monitored. 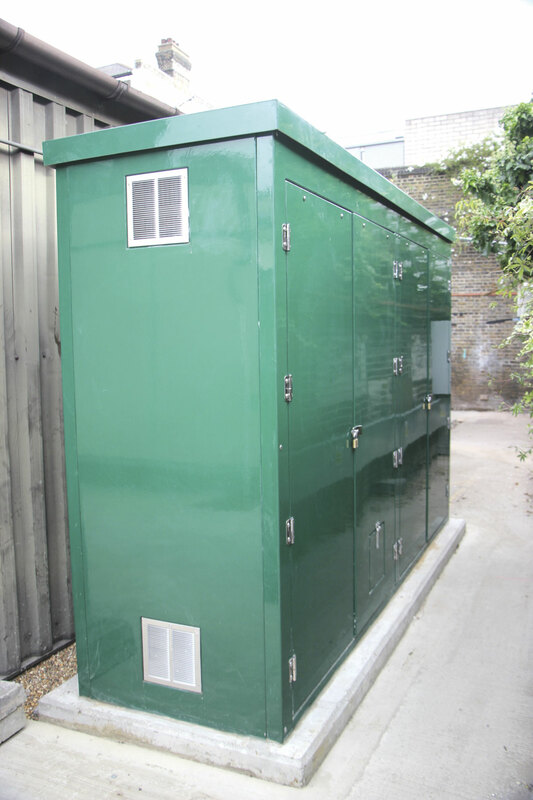 Both when it is charged and on which bay in the depot it is charged have to be managed if everything is to run smoothly. Without careful planning the run out of services in the morning could be impacted upon. Impressively, throughout the massive upheaval that has been required to prepare Waterloo, the garage has remained operational with a performance figure only marginally short of 100% at 99.8%. This is a huge credit to both the Go-Ahead team and its contractors. There are 80 drivers employed on the routes and all have been trained on driving electric buses. The 507/521 services have a weekday PVR of 48 buses, although this drops to only five at weekends. 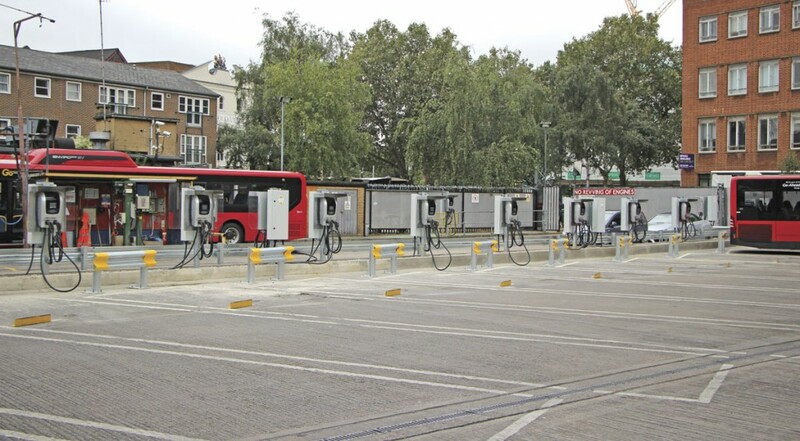 As has been the case prior to the introduction of the full electric fleet, five of the buses are not based at Waterloo but at Go-Ahead’s Mandela Way garage where there are additional charging points. This enables Waterloo to close for the weekend and the services to be run exclusively from Mandela Way. The joint venture bus is marketed as the BYD ADL Enviro200EV and is mounted on a stainless steel framed chassis built by BYD in Shenzhen, although in the future it is possible that BYD may supply the electrical equipment and systems with ADL taking on assembly of the chassis as well as the body. The zero-emission powertrain features two BYD developed water-cooled wheel hub motors, each giving a maximum power output of 90kW and torque of 350Nm at 7,500rpm. They incorporate a regenerative braking capability that converts kinetic energy to electricity which is stored in the on board batteries until required. 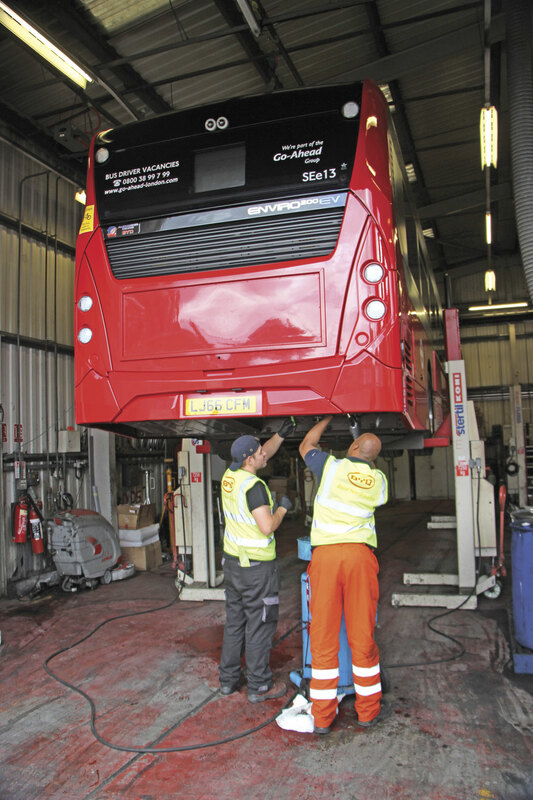 There are two battery packs weighing around three tonnes in total, half of which are mounted beneath a cover on the roof with the other half stacked vertically in the rear section of the bus. The lithium iron-phosphate batteries, which can be fully recycled, contain no electrolytes or heavy metals and are said to retain 75% of their charge capacity after 10 years of continuous operation. Control of the motors and batteries is by means of an integrated on board charger. The battery management element of this has a signal collector and controller monitoring the status of each cell. There are also controllers for the high voltage distribution box, DC-DC converter, inverter and the BCM (Battery Control Module). Other mechanical aspects of the chassis include the BYD EQ13 rear axle, a ZF RL85A front drop beam axle, ZF 8098 power assisted steering, full air suspension with ECAS electronic control system, a rear offside side-by-side cooling system and 24 volt negative earth electrical systems with two maintenance free 70Ah 12 volt batteries mounted in a slide-out carrier. The wheels are 22.5 inch. 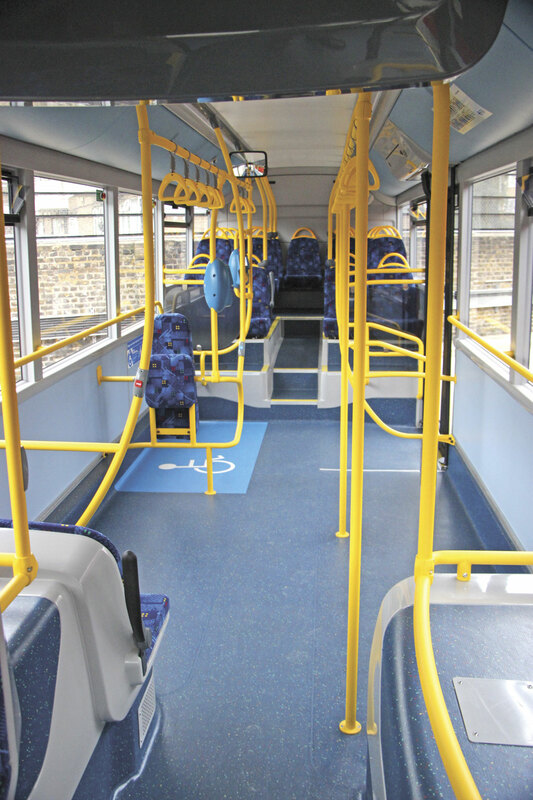 In common with other TfL London single deckers, the body is a dual door design. 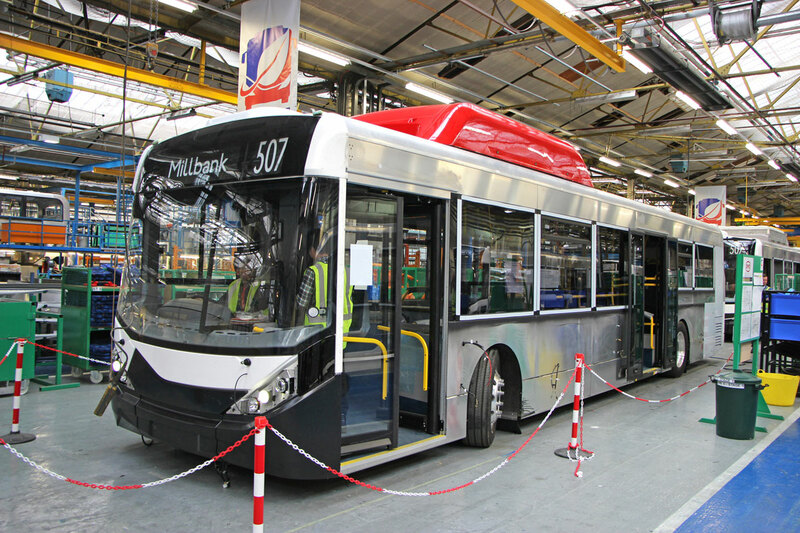 It employs aluminium extrusions and panels and composite roof panelling with stainless steel used in high stress areas and is based on the well known ADL Enviro200 MMC design. Glazing is ADL’s quick to replace QRG system. A cassette mounted Compak ramp is fitted at the centre door. Seats are by Isri and incorporate USB charging points on the back, the driver’s seat is the Chapman Nova Sideriser 2 Probac, the i-Bus equipment is the Navajo system and the powered destination blinds are by Mobitec. 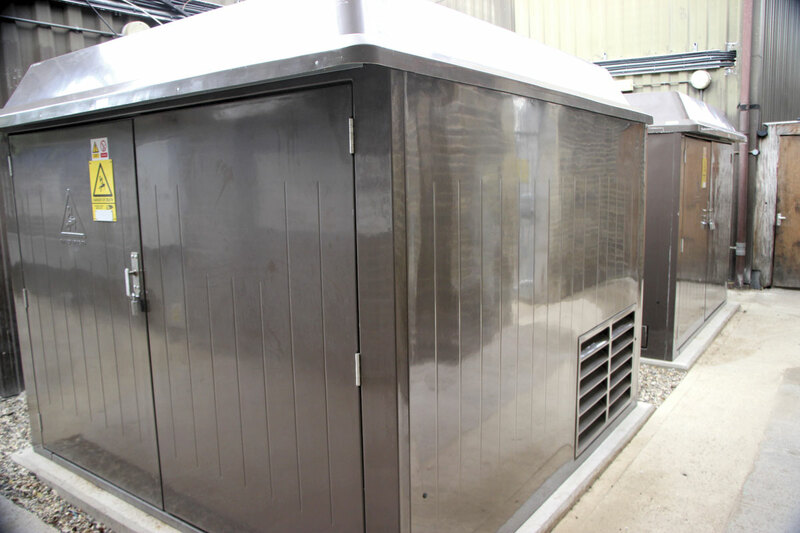 An air conditioning system is provided for the driver only with a blown air saloon system. 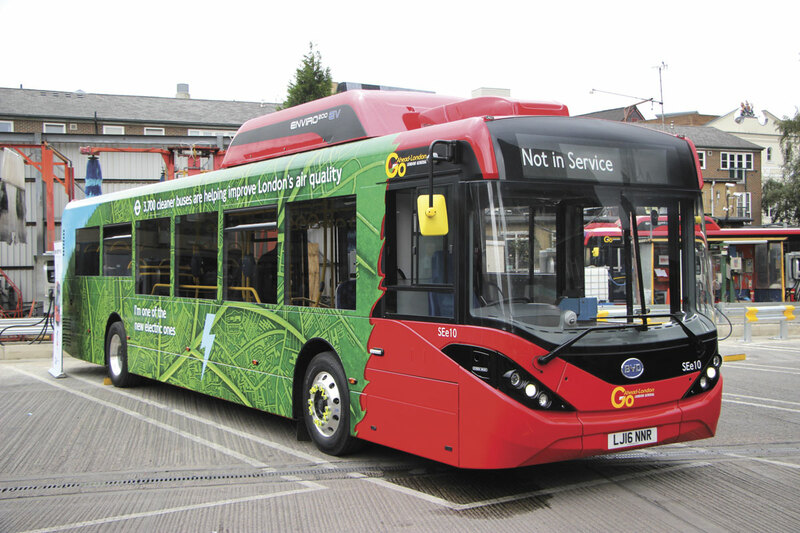 The Go-Ahead buses are 12.029m long, 2.470m wide and 3.385m high with a 6.1m wheelbase. Front and rear overhangs are 2.689m and 3.24m respectively. The unladen weight of the new Enviro200EV is 12,115kg, a significant reduction on the 13,800kg of the two fully BYD built buses. This has to make the new deliveries more energy efficient in operation because they are carrying less weight and also increases the theoretical passenger capacity from 62 to 90; although in practice it would be difficult to physically get that many people on board. Both have a seated capacity of 21, nearly all of it at the rear of the bus. The design GVW is 18.6 tonnes, with the design capacities of the axles 8.5tonnes (front) and 13.0 tonnes (rear). 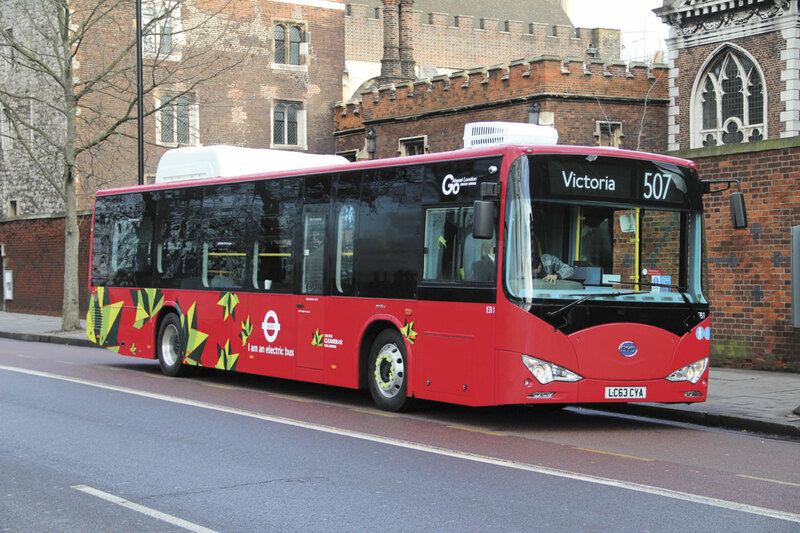 Talking to Richard Harrington about the performance of the initial pair of BYD buses that were leased in 2013, he said that the biggest problem for drivers had been vision because the battery packs over the front wheelarch made it difficult to see out of the nearside window. There had also been some body quality issues. Inevitably there were some technical issues too, though nothing too bad. One of the two rear hub mounted traction motors had been replaced on one of the buses, a problem handled swiftly by BYD, but otherwise there was nothing that had given cause for concern. These two vehicles are now being returned to BYD and are likely to enter trials with other operators. Apart from the photographs of dignitaries in front of the bus, an obligatory element of any bus launch is a trip on the vehicle, and it is often a bit of a bunfight when some of the passengers are lugging cameras and microphones with them. We went on a relatively short journey that also provided photo opportunities at Lambeth Palace and on Westminster Bridge before disembarking at City Hall for brunch. The really noticeable aspect was that pretty much all you could hear on board was people’s conversation because it is really quiet, noticeably more so than on the original BYDs which were not by any means noisy. It was also extremely smooth at all times. An enduring recollection of the launch of the first BYD electric buses in 2013 was how claustrophobic it felt because the battery packs over the front wheelarches massively restricted the forward view. On the Enviro200EV there is none of this, because the batteries are at the rear and on the roof, with the result that the interior is just as spacious and attractive as a diesel bus. I also noted the reduced window shimmer compared with diesels. Later, I returned to Waterloo garage on the bus with far fewer people on board and less traffic about and this revealed that the bus also has an impressive ability to accelerate as well as further emphasising just how quiet it is inside. It emphasised to me just why the link up between the two manufacturers is a good one. BYD have more automotive battery experience than anyone else in the business, despite the company only having been founded 22 years ago, but although their first London buses were better than those I had seen previously, they were still some way from the standard of construction and finish demanded by Western European customers. ADL do not have the battery technology and the means to develop their own competitive battery technology is probably beyond them, but they do know how to build a bus that will appeal to customers and operators alike. As ADL CEO, Colin Robertson, has often said, ‘I’d rather make a margin on building bodies than making no margin at all.’ Hopefully, the appeal of the combination will not be limited to UK operators but the many other cities worldwide that also face our capital’s air quality challenges. To date, 12 of the Enviro200EVs have been delivered and six are in service, a figure that was expected to rise to nine by Monday of this week once commissioning of the i-Bus information systems had been completed. All 51 will be built by October. I understand that all of the chassis have already made the six-week trip by boat from China and are at the Falkirk plant. Once complete, they make the 420 mile journey south under their own power, with three recharging stops en-route. The BYDs are not the only electric buses to have operated on the 507/521, two Irizar i2es are also running on the routes. 18 of the 2009 Euro5-EEV Mercedes-Benz Citaros currently on the 507/521 will be cascaded to a new five year contract for the 108 route from New Cross garage following refurbishment and upseating. Other Citaros are scheduled to be reallocated to commercial work (such as rail replacement) and the training fleet, or will go elsewhere in the Group with Oxford understood to be one of the recipients. 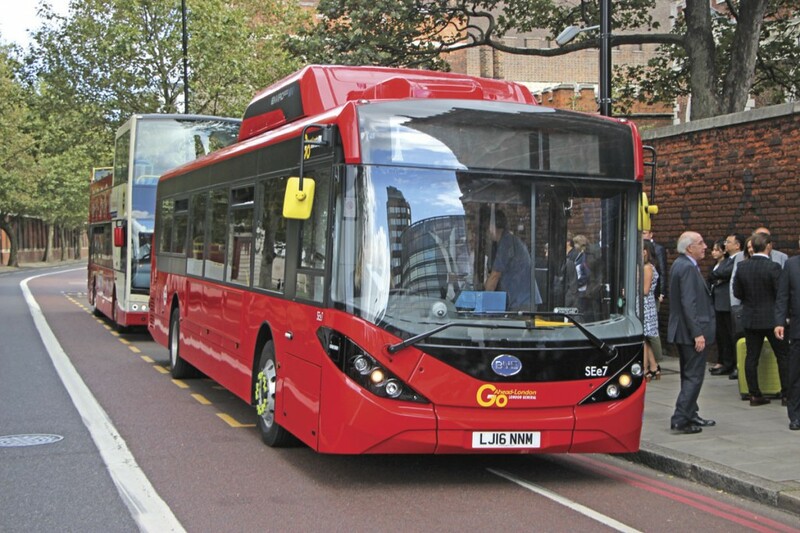 Val Shawcross claimed that, with the 51 new buses, TfL will have a total of 73 fully electric buses in service. Others include the two Irizars, five BYD double deckers running for Metroline on route 98 and a number of Optare MetroCity EVs. In a video presentation on the E200EVs that included a lot of footage of the buses on test at Millbrook, it was revealed that ADL and BYD are working on a double deck option. It will be interesting to see what they can do to reduce weight and increase capacity because the five existing double deckers can only operate because they have derogation enabling them to run with a GVW of 19 tonnes. Leon Daniels spoke of a contract for a second fully electric single deck route and Go-Ahead has also won this, with the retention of the 360 that it currently operates from Camberwell using Wrightbus hybrids. Initially the existing contract has been extended for nine months and it is planned that the electrics will start running in early 2018. John Trayner said this date would be brought forward if it proved possible to do so. The requirement is for 14 new 10.8m buses and I understand that no order has yet been placed. BYD and ADL have already announced that they will jointly be offering a 10.8m all electric. A prototype Chinese-built version will be on show at CENEX LCV next week but I understand that we cannot expect to see a completed jointly developed bus before the spring of next year. 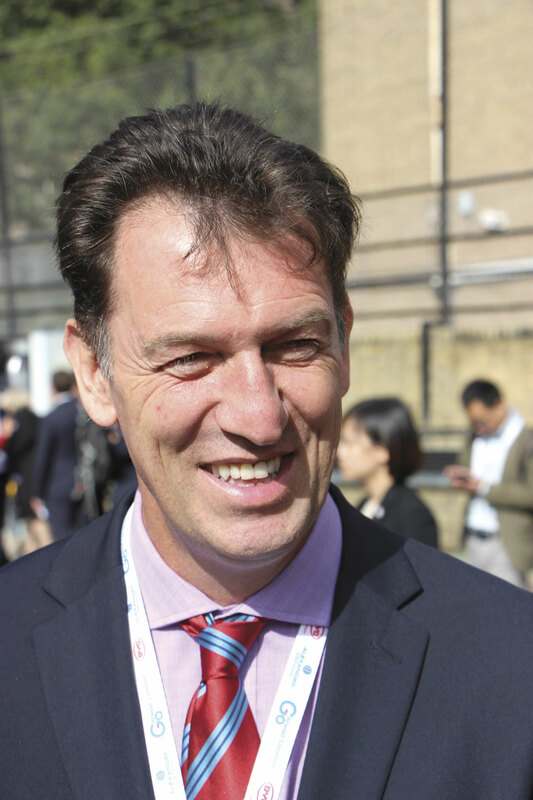 As well as launching the new buses, the event marked the first appearance of Frank Thorpe, recently appointed to the new position of Country Manager, at a major press event. 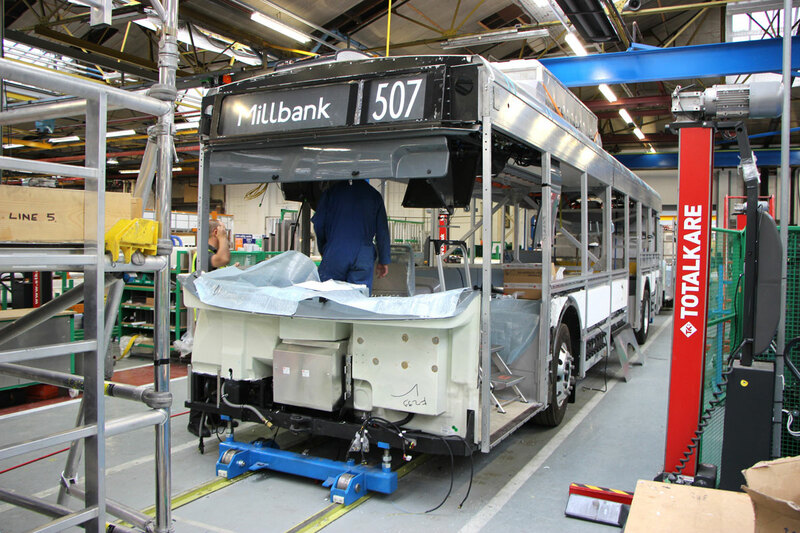 Frank has a lot of experience in the industry having managed the family’s London bus operation prior to its sale to Metroline, worked for Go-Ahead in London, and headed up GKN Hybrid Bus Systems prior to taking on the role. I understand that no other orders have yet been placed for ADL/BYD products, but that is hardly surprising as the installation of infrastructure required before such buses go into service means that the procurement process will be much more long winded until we reach an electric replacement stage. Furthermore, as electric motors wear less and should therefore last longer, that replacement process itself may be extended. What is clear is that ADL and BYD have worked very well together on this project and both parties see immense potential for the partnership to win business in the future. TfL’s determination to increase the size of its contracted electric fleet and possibly extend the range of the LEZ further only emphasises this point.